El Paraíso de Don Quijote are two rural houses located within a 16,000 m2 estate, completely fenced, located in the "chain" place. These were built about 100 years ago for farm use. Later they were enlarged and restored, conserving all the original charm. 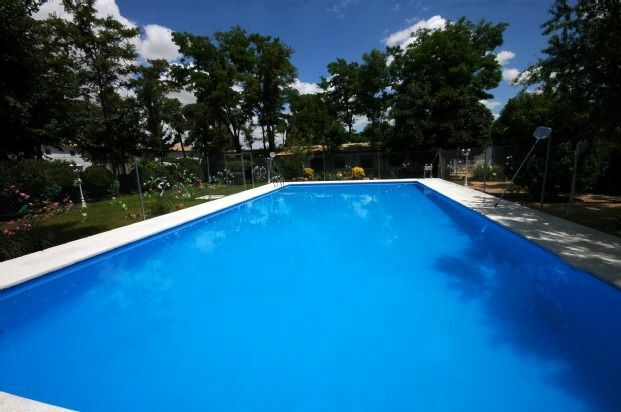 It is the IDEAL choice for LARGE GROUPS and for FAMILIES WITH CHILDREN. Our stay guarantees rest, relaxation and tranquility necessary to disconnect from the daily routine. In addition, it offers children an authentic contact with nature and serves as a learning experience with our small farm. All this without forgetting the new technologies, since we have free WIFI and Movistar +. It also has 3 bathrooms (1 of them with double shower) and 1 living room with kitchen of 28 m2. It also has 3 bathrooms, kitchen and living room with wood stove. Adjacent to the blue house, we find a huge living room with kitchen and bathroom of over 70 m2, to make the stay of the guests more comfortable. It also has a wood stove. Annexed to this room there is a 30m2 glazed porch with sofas. Game room, 70 m2. It has a wood stove, sofa area, table tennis, table football, seesaws, low tables and a blackboard to color. On the outside, it presides over our pool of 12. 5x8 meters. In addition there are two barbecues, several garden areas with numerous trees that provide a pleasant shade on the hottest days and a small farm with chickens, ducks and roosters, with which children enjoy while discovering where the eggs come from. For the little ones, we have a small playground. -The Blue House (10 people) has four bedrooms: - 1 of them with 2 single beds - 1 with 2 single beds + 1 extra bed - 1 with a double bed - 1 with double bed + 1 extra bed It also has three bathrooms (1 of them with double shower) and a living room with kitchen of 28 m2, extended in November 2014. -The house of the villagers (10 people) offers 5 bedrooms: - 2 with double beds - 3 with double beds It also has 3 bathrooms, kitchen and living room with wood stove. - We have a living room + kitchen of 70m2. - Annex to the living room there is a 30 m2 glazed porch with sofas. - 2 barbecues (free firewood for both barbecues and stoves) - Huge pool of 12. 5x8 meters. - Large private parking inside the farm. - We have expanded our facilities with another space of 70m2, enabled as a games room (ping-pong table and foosball) and as a children's area, with tables for games and wall-blackboard to paint. - Movistar +. - Free Wifi zone. Pasamos unos dias en agosto y estuvimos genial. La finca es espectacular, el entorno, el silencio, el descanso no puede ser mejor. Respecto a la casa muy limpia, camas comodas, utensilios para todo, no te falta de nada ni tienes que llevar de nada. Un jardin precioso con una piscina enorme y con una buena barbacoa. Mesas y sillas para comer debajo de un nispero y sitio para dejar el coche dentro de la finca. Vale la pena estar unos dias. Relacion calidad- precio debe ser una de las mejores opciones de la zona sin duda. Repertiremos seguro. Los niños disfrutan mucho entre la piscina, mesa de ping pong, futbolín ..
Estuvimos un fin de semana un grupo de amigos con niños. Las casas están muy bien, no tengo ninguna pega. Limpias y completas. Lo que peor está es la finca, me sorprende leer en otros comentarios que estaba tan bien cuidada, intuyo que serán comentarios más antiguos y antes estaría mejor. Ahora está algo descuidada, es mucho terreno que mantener. Columpios oxidados, una bicicleta vieja , sillas destartaladas... Y hay zonas que se podía acceder y había instrumental y algún elemento un poco peligroso para los niños. La sala de juegos está muy bien pero es una pena que , por ejemplo, todas las palas de pingpong estén rotas. En conclusión, la casa limpia y completa pero el exterior regular; por el precio que tiene, que no es barato, podría estar mejor. Aunque lo pasamos fenomenal y sitio para correr los niños hay de sobra.